If I stop a scan will I still be able to delete any threats found during that scan? If I may.. 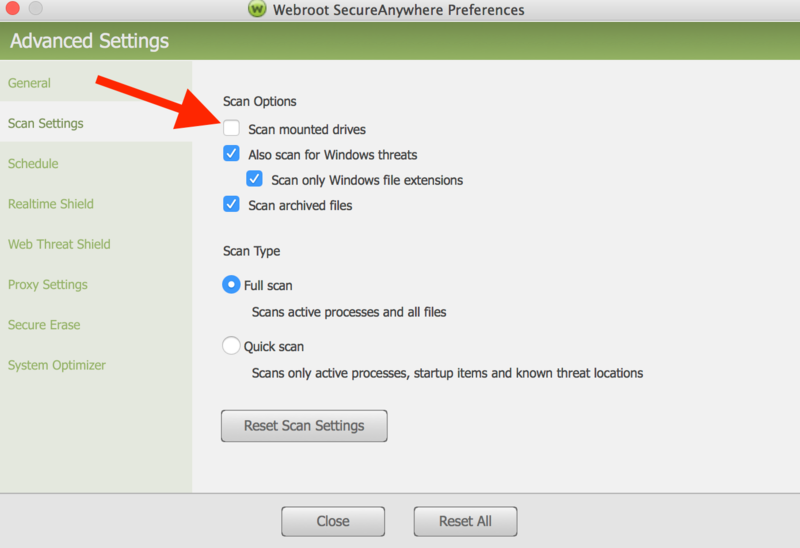 In some cases, Webroot will detect a threat that is located on your backup, such as Time Machine. If the file are in the backup, then they cannot hurt your system. You would have to restore the files from the backup to get them on the system, and at that point the Real Time Shield in Webroot would find and remove them. Even though Webroot cannot remove these files, as space for newer backups is needed the older backups will be deleted. This will delete the threats from the backup as well. Stop the scan. DO NOT DELETE ANYTHING. Thanks for the quick reply, but what you're saying is that I've wasted nearly 5 days of scanning? What about my external data drive? I know some things were found on that drive. Why should I not delete anything? Anything on your external drives if they are a threat Webroot will hit on it when or if you transfer it to your main drive. Scanning external drives could go on for days and days. My scan is about 10 minutes on a new Mac. Maybe @Ssherjj our Mac Guru could shed some light on this if I'm missing something. Thanks again for your help. That's what I figured but I've stopped the scan and am rerunning the scan only on my iMac internal drive. Once I've done that then I'll disconnect the backup drive, then turn scan mounted drives back on and scan both the intermal and external data drives again. Finally after I delete any threats found I'll erase the backup and do a full backup. Awkward, but that might solve my threat removal problem. Ah! I would assume you're correct, but I often open files directly from the external drive. Will Webroot intercept those files as they open and protect if there is something embedded? Yes Real Time Shield in Webroot would remove any active threats on your C drive,..if transfered from your external drive. Webroot will protect..